To see all the homes for sale in Val Verde, click the button on the right. Residents love northwest Oklahoma City. 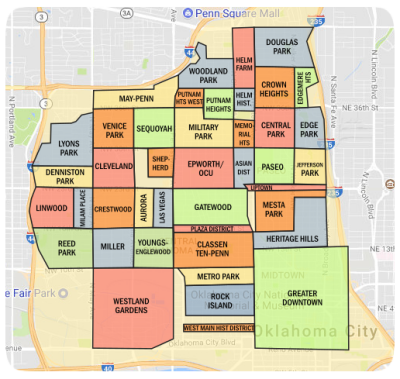 Val Verde, Oklahoma City, OK homes for sale offer prospective home buyers an opportunity to live in a lovely northwest side neighborhood. The boundaries for the neighborhood are North Meridian Avenue to the east, North MacArthur Boulevard to the west and Northwest 122nd Street to the south. The majority of the community's northern boundary is the city's popular Martin Park. There is a great variety among home sizes, many on large lots, with some having enough space to accommodate both swimming pools and tennis courts. Architecture varies although French influences may be seen in curved arched entranceways and stonework facades. Streets in this upscale neighborhood are designed to afford residents a good deal of privacy. The majority of homes are situated on streets with cul-de-sacs and those that simply loop around, encouraging very little through traffic. Bluff Creek runs through the community, parallel to Val Verde Drive, and contributes to the area's lush natural landscapes. In fact, the abundance of trees, in addition to the well manicured lawns, really enhances curb appeal. This neighborhood is almost entirely composed of single family homes, although along the western border of the area apartment or town homes can be found. Convenience stores and a sprinkling of fast food establishments are available only in the southwest corner of the community, which again helps keep through traffic within the area to a minimum. 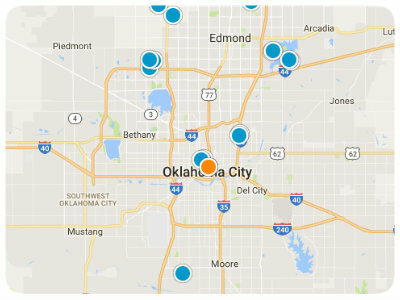 Properties for sale in Val Verde, Oklahoma City, Ok are desirable for many reasons. The location is absolutely fantastic. The community is situated adjacent to Martin Park and just north of Hefner Lake. Martin Park has one hundred forty-four acres of woods and grasslands with three and a half miles of trails. The park is home to the Martin Park Nature Center which houses a hands-on education center exhibiting a variety of reptiles and insects. There is also an observation bee hive with more than eight thousand active bees. The center holds popular events, such as guided full moon hikes, and has guest lecturers and exhibits going on year round. The park is truly a wonderful place to explore for children and adults alike. Lake Hefner is a short distance south on North Meridian Avenue. The lake is an extremely popular destination for locals and visitors. The fishing dock is enclosed, heated and open year round, there are two covered piers, boat ramps and wets slips, as well as dry storage for boats. A nine mile trail runs around the lake, there are playgrounds, picnic areas, ball fields and the Lake Hefner Golf Course. These and other well maintained parks should indicate to newcomers the city's commitment to conservation and encouraging a healthy lifestyle. With respect to health care providers, Val Verde is again ideally located. On the east side of Martin Park on North Meridian Avenue is a large complex with numerous health care providers, including Mercy Health Center and Oklahoma Heart Hospital. Nearby schools include highly rated schools in the Deer Creek School District, Oklahoma City Public School District and Putnam City Schools. There are a number of private schools as well, giving parents multiple options to choose from. Of course, the state as a whole is known for its plentiful educational options with more than forty colleges and universities. The state's high value on education is reflected in their promise of scholarships to its most needy young residents, as a means to ensure that those who want a college education can realize that dream regardless of their ability to pay. Val Verde is a terrific suburb in a dynamic city, check it out today.